Above is an internet speed test from AT&T's UVerse Gigapower fiber internet service that is about to be released in Dunwoody to both residential and business customers. In case you are not aware, it is quite fast and I dare you to test your speed compared to that shown above. To test your speed just click the link below. The city has been working to bolster internet speeds for quite some time and now it appears that there may be numerous companies getting ready to jump into this market. The more the merrier as competition is good for the consumer but as a loyal ATT& T Uverse guy, I say kudos to AT&T for being the first in the Dunwoody market. Here is the official press release from AT&T. U-verse with AT&T GigaPower already is available in parts of Atlanta, Decatur, Newnan, Sandy Springs and surrounding communities. AT&T GigaPower offers Internet speeds up to 1 gigabit per second. It can improve the experience for customers when connecting to the cloud, doing a videoconference, playing online games and more. The high-speed Internet service is 99.9 percent reliable. It offers the fastest, most powerful Wi-Fi signal with an upgraded home gateway using the latest technology. The new gateway connects more devices with faster speeds from nearly anywhere in the home or business. Customers who sign up for U-verse with AT&T GigaPower will also have access to award-winning U-verse TV and Voice services. New customers can watch and record up to six HD programs at the same time. AT&T GigaPower customers will also be able to record and store more of their favorite shows – up to 900 hours of SD or 330 hours of HD programming. Customers can use the AT&T U-verse App on smartphones and tablets to watch more than 250 live TV channels in their home and more than 210 live TV channels while on the go. Customers can also stream video on demand, schedule DVR recordings and access other features from the U-verse app. The success of the first AT&T GigaPower market in Austin, Texas led to a major expansion in 2014. AT&T plans to expand its 100 percent fiber-optic network in up to 25 markets. The company has launched U-verse with AT&T GigaPower in 15 markets. AT&T has announced plans to offer AT&T GigaPower in parts of the Jacksonville, St. Louis and San Antonio markets. AT&T will continue to roll out its fastest Internet services over its all-fiber network to reach more than 14 million residential and commercial locations. AT&T has invested in Georgia communications networks, people and local communities for 136 years. Between 2012 through 2014, AT&T invested more than $5.4 billion in its best-in-class wireless and wired networks in Georgia, driving a wide range of upgrades to enhance reliability, coverage, speed and performance for residents and business customers. AT&T employs about 21,000 people across the state. For more information on U-verse with AT&T GigaPower, or to check availability, please visit att.com/gigapower. The City of Dunwoody wants to know how we can best fill the Senior Housing need for those who want to stay local. I have requested our City Manager to see if a member of staff can attend to discover best practices for providing housing to our seniors who want to stay in Dunwoody. Other places with good data below. 11Alive Jennifer Leslie - When work crews began putting in a new water main along busy Mt. Vernon Road in Dunwoody, something unexpected happened. Drivers began to embrace the inconvenience. "People really like us," said traffic flagger Hilary Quinn. "They bring us food and water and wave at us." The traffic flaggers are all women, who wear shorts and tank tops and break the mold. They're so popular, they've been featured in a local blog. "When people drive down the road, we get a lot of second looks," said traffic flagger Gigi Burg. "They want to know, why are all these women out here?" It's an obvious question with a complicated answer. "We're all dealing with some harder backgrounds and struggles in life," Quinn said. The crew started years ago with core group of women who were placed with GS Construction as part of a job training program for drug treatment. "I've only been clean or sober for four years, so I know what it means to leave the past in the past," said Burg, who was one of the first hired. In the years since, she brought on more women. Some of them are overcoming addictions. Others are dealing with felony records. 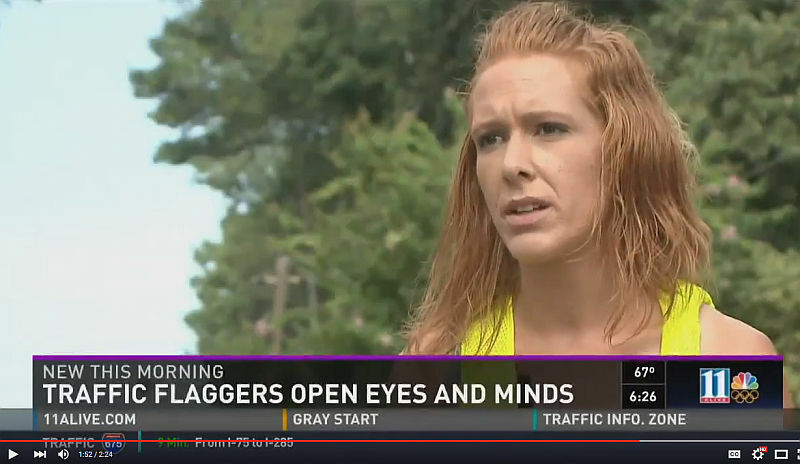 "It's opened my eyes and helped me realize I do have other options," said traffic flagger Tiffany. "I don't have to go out and commit a crime just to survive." There are about 20 women now who work so well together that GS Construction CEO Alessandro Salvo is branching out with a new nonprofit called The Pink Ladies Traffic Control. The goal is to hire and help more women with a troubled past. "If they want to stay and grow with the company, that's fine," Salvo said. "If they just need it as a stepping stone to get their life back in order, that's good, too." "It is rewarding know there's a company that backs you up and supports you through getting back on track and getting your life straight," Quinn added. GS Construction could actually benefit financially from hiring employees with criminal records. One of the flaggers recently told Salvo that the company qualifies for work opportunity tax credits, and he's applying for them now. Register Today as price increases go into effect soon. Pebble Tossers is a nonprofit youth development organization driven with a mission to positively impact the lives of youth through enriching community service and hands on educational opportunities that establish strong leadership qualities, build character and improve personal values. Founded in 2008, Pebble Tossers membership has grown to 16,000 youth serving 122 nonprofit organizations throughout Metro Atlanta. hosting their own mini-service projects promoting their own missions. For more information on participating in the race, volunteering for the race or sponsorships, please contact Jennifer Guynn, jguynn@pebbletossers.org or 678-757-5597. New Dunwoody Chick-fill-A at Perimeter Mall on Hammond Drive opens on Wednesday - the line for free food starts on Tuesday. Chick-fil-A Operator Alex Rodriguez is excited to serve the Dunwoody Community soon! As a part of our welcome to you, we would like to invite residents from the following zip codes to come and be a part of our opening celebration and participate in the First 100. A valid ID is required to participate. If your ID does not reflect your current zip code, please visit our FAQs to see a list of acceptable documents to verify your current residence. We look forward to meeting you! This restaurant will open on WEDNESDAY. The First 100 promotion will begin at 6:00am on TUESDAY. Click here for more details on the First 100 promotion. Excerpt below - click here for full document. The list of enhancements to the 2016 budget and their costs can be found on page 35 of the document and I recommend that this be reviewed for both what is there and what is not. It is this list of new items being proposed that the budget committee will need to be determining if appropriate or if other items are missing. The budget committee this year is Lynn Deutsch, Doug Thompson, & Jim Riticher and the first formal hearing has been set for the City Council Meeting of October 12th. We are pleased to submit the following Fiscal Year (FY) 2016 Budget to City Council and residents for examination and consideration. We encourage citizen feedback and involvement throughout the budget process to facilitate the development of an annual fiscal plan which meets the needs of the City of Dunwoody. The past six years of cityhood have demonstrated the resilience and fortitude of our city and its residents. Starting out in a time of economic uncertainty and market trepidation, the city strategically moved to establish sound, prudent policies and investments which would help bring services and infrastructure back within acceptable levels. Community safety, public amenities and basic fundamentals, which had been long neglected, began being addressed over time thanks in part to pragmatic fiscal planning and prioritization. Building upon the experience, achievements and fundamentals from the previous six years, the City of Dunwoody is poised to address the critical needs as identified by city staff and our community while systematically implementing plans with a clear focus on the longer term vision for the City. The FY 2016 Budget represents a distinctive path for progress. The directive contained herein provides opportunities for continuous improvement, carefully nurturing the pillars of stability (safety, infrastructure and amenities) while simultaneously balancing strategies for future success. By continually fine tuning the City’s path for progress, we seek to advance the kind of quality of life attributes which have shaped Dunwoody. Retaining the fiscally conservative approach which fostered previous success, standards which our residents have come to expect, the FY 2016 Budget forecasts conservative revenue growth. This cautious planning affords the City the opportunity to maintain our original 2.74 millage rate while also aligning expectations for modest revenues from property taxes and new building permit collections. The City experienced a rise in the tax digest and slower-paced economic growth in 2015. The tax digest rose just slightly and business licenses are falling short of last year’s pace. The diversity in the City’s revenue streams lessens the effects of this slowed growth. Building permits are strong as a result of business relocations and expansions and hotel taxes are on track to exceed budgeted levels. The City’s overall revenues are anticipated to exceed the $31.7 million in revenues appropriated in the FY 2015 Budget. The City of Dunwoody continues to operate a lean and efficient model of governing with the Split Contract Service model, outsourcing the majority of government service functions. The Split Contract Service model enables the City to maintain a high level of service for its citizens while maintaining expenditures at or near the level established when the City was incorporated in a down economy. With investments in outside training and internal cross-training, the City works diligently to staff departments efficiently. The FY 2016 Budget for all appropriated funds totals approximately $34 million in revenues. The defining Path for Progress elements of the FY 2016 Budget include allocating more than $4.5 million for paving, intersection and sidewalk improvements and specific allocations for long-term enhancements such as a connector road, a gateway augmentation and planning and design of future City Hall. The FY 2016 Budget includes a $1.6 million transfer in General Fund dollars to pay debt associated with Project Renaissance land purchases. These debt payments will be offset with revenue generated from the sale of lots related to Project Renaissance. Of this transfer, $1.4 million represents an additional principal payment toward the variable rate series of this debt. The FY 2016 Budget also includes $2.3 million in General Fund transfers and $5 million in HOST Fund transfers to our Capital Projects program for the development of critical city assets, infrastructure projects, and public safety enhancements. The Capital Projects list for 2016 includes street resurfacing, sidewalk construction, intersection improvements, park improvements, and public safety equipment. The FY 2016 Budget utilizes approximately $25,000 of reserves in the Stormwater Utility Fund to speed up the timing of significant improvements to stormwater infrastructure while maintaining the healthy $3 million stormwater fund reserve for catastrophic stormwater events. The remaining $25 million in revenue is budgeted for operations and cash reserves. Based on Council policy, the FY 2016 Budget anticipates maintaining a reserve sufficient to cover government operations for four months. The FY 2016 Budget maintains the City’s original 2.74 millage rate and does not anticipate an increase in that rate. The city’s emphasis on the “Three P’s”: Police, Paving, and Parks has not diminished and is further supported through the FY 2016 Budget. In order to address the needs of the community and the challenges presented for the future the City has created a FY 2016 Budget list of key expenditures and improvements which clearly demonstrate the focus on the needs of today and the Path for Progress. 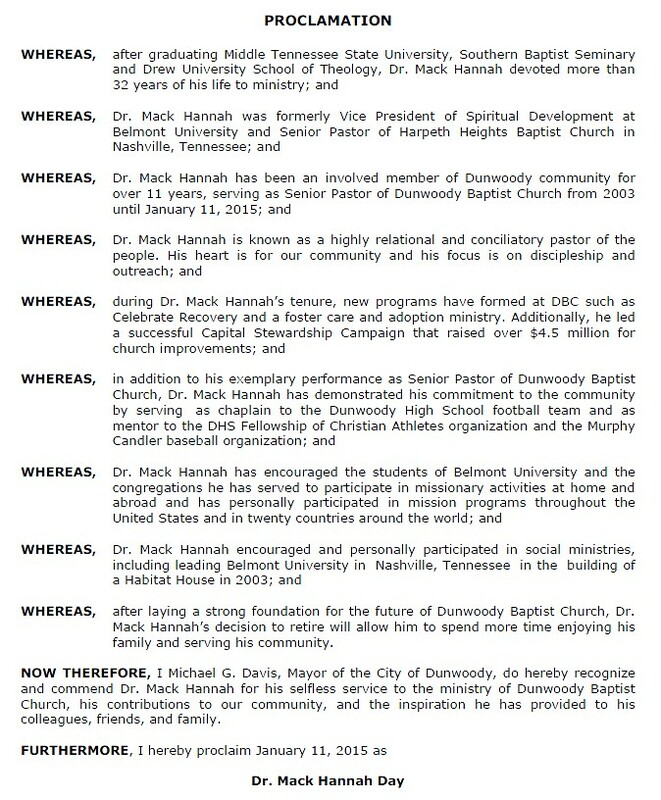 While this is not a comprehensive list of enhancement requests, it does highlight the City’s focus on continued fiscally conservative spending while supporting the primary reasons for becoming a city – namely the local control over safety, infrastructure, and community development to improve the quality of life for all of Dunwoody’s residents, businesses, and visitors. 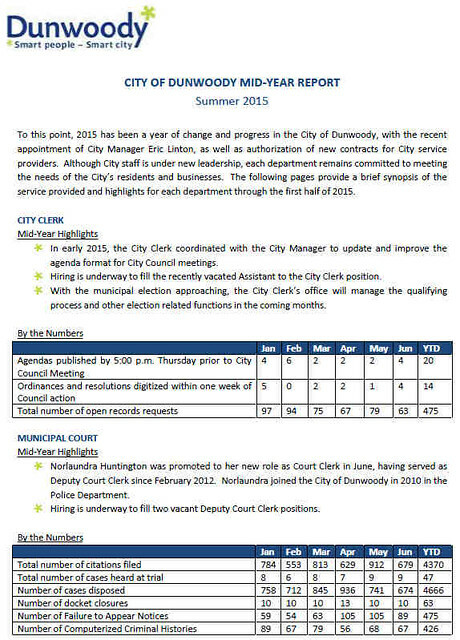 In 2015 the City concluded the Request for Proposal (RFP) process to rebid the City of Dunwoody Split Contract Service model by which the City staffs a majority of government service functions. At the conclusion of the RFP selection process, the City decided to bring in-house five formerly contracted positions (Community Development Director, Parks and Recreation Director, Economic Development Director, a part time Economic Development Retention Manager, Human Resources Director and a Human Resources Specialist). These new City employees, along with one new contract service provider chosen from the RFP process presents a change in the makeup of previous staffing structure which will be sensible to monitor and assess for a customer service and performance standpoint. 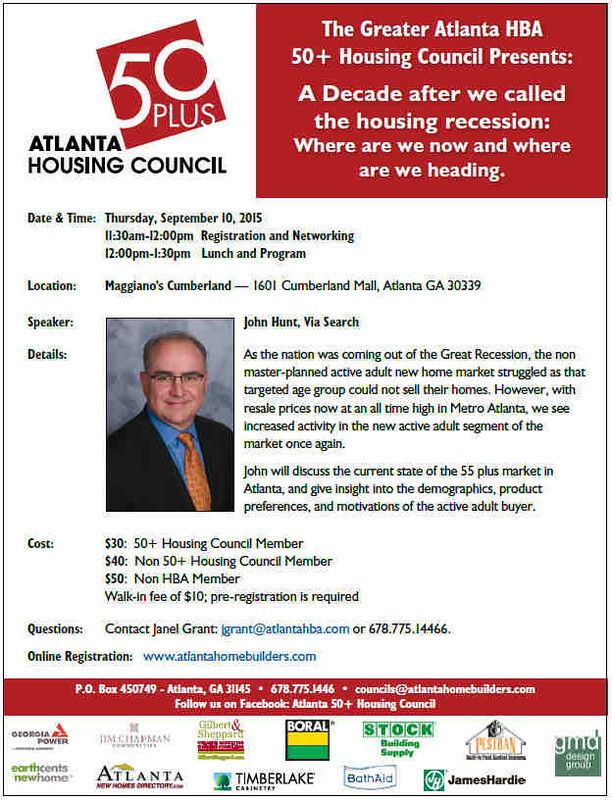 The economic downturn experienced since 2009 has not yet completely returned Dunwoody revenues to pre-recession peaks and office vacancy rates indicate the economy has not reentered full recovery mode. The potential for rising interest rates and increased construction costs is possible and this could impede borrowing, construction, and development initiatives within the city and region. The City must prepare for general gaps in revenue streams and be mindful of longer-term external factors which may be out of the City’s control but also present issues for prudent economic management. With future planning and projects being forwarded, it will be especially pragmatic for the City to practice transparency and civic engagement as it moves forward with planning for the design and construction of a City Hall. A City Hall can become a signature facility and a symbol of the character, persona and style of a city and its services. It will be important to work with the community to help determine the best fit, place and design for a government facility. Construction activities, both those performed by the city and those being done by the private sector (i.e. State Farm, Hotel Equities, etc.) may have a tendency to create congestion and deviations in various traffic and business patterns. Also, improvements at the Tilly Mill at North Peachtree intersection will commence in 2015, and carry on into 2016, which could potentially bring additional attention to a high-profile project and heavily trafficked intersection. Construction activity and changes at various locations in the City will need to be monitored and addressed to ensure productivity and efficiency are not compromised. Elements of the community-developed Parks, Recreation, and Open Space Master Plan; Georgetown/North Shallowford Master Plan; and Dunwoody Village Master Plan each will undergo implementation activities and plan upgrades at different phases in the coming year. The continued revitalization efforts for Georgetown and Chamblee Dunwoody corridor will continue throughout 2016 and residents, businesses and visitors will begin to experience the benefits provided through the program. Appropriate and timely community input will need to be gauged and addresses to ensure project successes and continued redevelopment and growth of these areas as outlined in their respective Master Plans. Because the City’s lawsuit with DeKalb County wrapped up and settled in 2015, the City is lowering its anticipated legal expenses for 2016. The lawsuit was a leading contributor to the City’s legal preparation and activities and a reduction in this expense may leave the City vulnerable to unforeseen lawsuits. Careful nurturing, attention and collaboration with the community will enable the City to address future stability and successful program advancement. A Path for Progress is a longer-term objective which comes to fruition with watchful foresight, contentious planning and vigilant implementation. Through the FY 2016 Budget, the City seeks to continue its delivery of quality customer service based upon a financially responsible and fiscally sound framework and provide deliverable solutions for the community’s vision of a better Dunwoody. We look forward to a collaborative review of the FY 2015 Budget proposal over the next two months and appreciate your thoughtful input throughout the process. Slingshot Entertainment Center with Go-Karts, Ninja Obstacle Course & Bowling is now open. The first of it’s kind, Slingshot Entertainment is the largest indoor entertainment facility in Georgia! Located in the Metro Atlanta area, Slingshot features an interactive bowling lounge, 100% electric high-speed Sodi go-karting, a tri-level kids mega play arena, and the largest indoor ninja obstacle course in the United States! I happened to be driving by when I saw the new sign with a few cars in the parking lot, so I stopped and discovered they were doing their soft opening today. I took a quick tour of the Slingshot facility in what use to be the BJ's Wholesale Warehouse located at Peachtree Industrial Boulevard & Jimmy Carter. The go-karts were going full steam and the bowling was operational with numerous TV's around the entertainment and drinking facility. The Ninja Obstacle courses (both adult & kids) will be open in a day or two and they are still constructing a huge (told it would be Guinness World Record worthy) play room to keep the little kids occupied while the adults have their own fun. All entertainment is half price this weekend for their soft opening. Check it out. Speeding in Dunwoody School Zones will not be not tolerated. Over 50 speeding tickets have been given in school zones. Approval of Disposition of Excess Property. SECOND READ: Amendment to Chapter 26 re: Special Event Permit Fee Exceptions. Request from Dunwoody Preservation Trust for Signature Event Designation for Apple CiderDays. SECOND READ: RZ 15-071: Pursuant to the City of Dunwoody Zoning Ordinance, applicant,Acadia Homes & Neighborhoods c/o Smith, Gambrell & Russell, LLP on behalf of CR VPerimeter LLC, seeks permission to rezone property currently zoned Office-Institution (O-I)District to Multi-dwelling Residential-85 (RM-85) District located at 54 Perimeter Center East, Dunwoody, GA 30346, tax parcel ID 18-347-01-008; and to rezone property currently zoned Single-dwelling Residential-100 (R-100) District to Multi-dwelling Residential-85 (RM-85) District located at 4340, 4348, 4356, 4364, 4372, 4380 and 4388 Old Georgetown Trail, Dunwoody, GA 30338, tax parcel IDs 18-346-05-052, 053, 054, 055, 056, 057, 058, to allow for construction of an 87-unit, fee simple townhome development. CP 15-071: Pursuant to the City of Dunwoody Zoning Ordinance, applicant, Acadia Homes &Neighborhoods c/o Smith, Gambrell & Russell, LLP on behalf of CR V Perimeter LLC, seeksan amendment to the City of Dunwoody Comprehensive Land Use Plan to modifyclassifications, to allow for construction of an 87-unit, fee simple townhome development. The subject property is located at 54 Perimeter Center East, Dunwoody, GA 30346, tax parcel ID 18-347-01-008; and 4340, 4348, 4356, 4364, 4372, 4380 and 4388 Old Georgetown Trail, tax parcel IDs 18-346-05-052, 053, 054, 055, 056, 057, 058. Approval of Development Agreement between the City of Dunwoody and Atlanta OfficeInvestment, LLC, c/o KDC AH Investments One, LP for Property Located at 245 PerimeterCenter Parkway, Dunwoody, GA 30346. The Tax Parcel is 18-329-04-003.
to allow for construction of a mixed-use commercial/retail/restaurant PD development. The subject property is located at 245 Perimeter Center Parkway, Dunwoody, GA 30346. The tax parcel is 18-329-04-003. Dunwoody Comprehensive Land Use Plan Update might have allowed office towers at North Peachtree without council edits. At the last City Council meeting we needed to "approve" sending the draft comprehensive land use plan to the State for review as we were told we could make minor tweaks before we did a final approval in a few months. 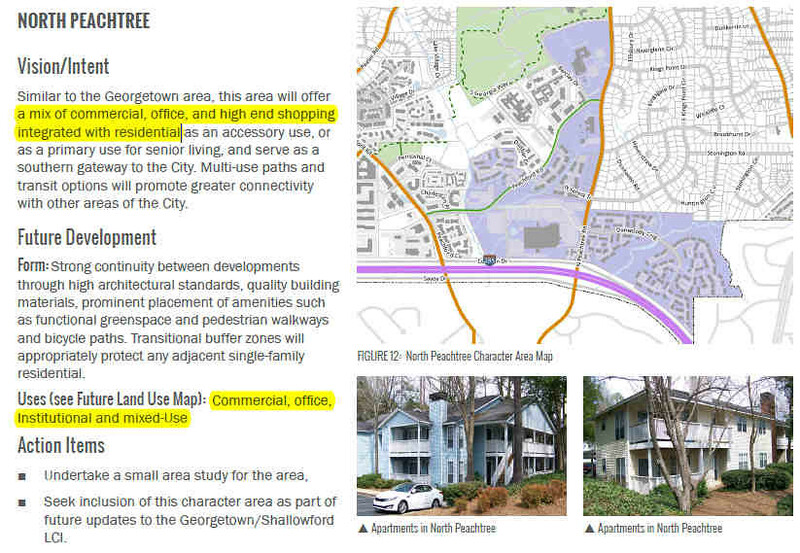 The city had a few Character areas spelled out that everyone is familiar with like Perimeter Center, Dunwoody Village, Georgetown but there was a new character area labeled as "North Peachtree" whereby areas that are currently zoned R-100 for single family homes on North Peachtree Road would be allowed be converted to commercial uses. If you look at the map of North Peachtree below and are familiar with the area you will note that there about seven single family homes just South of Chesnut Elementary that if the land use plan were approved as final, could be immediately converted into a business operation. Back in 2007, we had a similar rezoning attempted on North Peachtree Rd under DeKalb County and the neighborhood was adamantly opposed. Without changes to what was proposed, a developer could have also purchased the huge Dunwoody Crossing Apartment complex (I have a very hard time calling it Dunwoody Village that it is currently named) and built Office Towers with little way for the city to object as our Comp Plan would have allowed it! At the last City Council meeting myself and Councilwoman Deutsch argued that this Character area should be removed prior to submission as we believed it improper and was never vetted with the community. With a recommendation to remove this character area, the plan moved to the state for preliminary review. 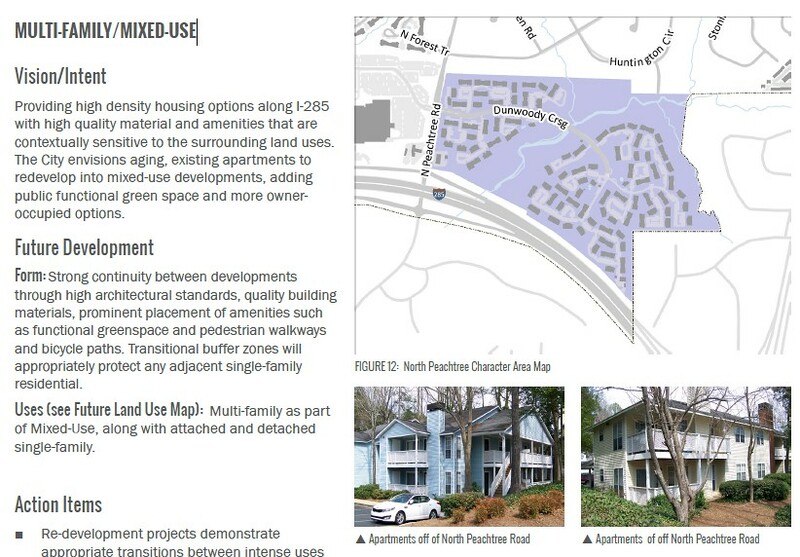 In this updated version of the Comprehensive Land Use Plan, North Peachtree has been changed to Multi-Family Mixed Use with the footprint drastically reduced to just the one apartment complex and it will no longer allow Office and Commercial by right, instead they will need to vet large scale changes to the Council with much public review. Anyway the words in this document really matter and it will take a close review to verify that what is written is what the community wants. Please feel free to assist the Council with the latest version of the Comp Plan which is posted here as we are discussing it again on Monday. Local District 1 Councilman Denis Shortal vacated his post on August 19 in order to run for Mayor. Until his seat is filled in the next election, District 1 residents are welcome to direct their requests and needs to my colleagues and me on Council. This direct access to elected officials is part of what makes Dunwoody great. Construction Approved: Tilly Mill Rd. at N. Peachtree Rd/Peeler Rd. On July 27, City Council voted 6-1 to approve a $4.5 million construction contract for much needed intersection improvements on Tilly Mill Rd. at N. Peachtree Rd., including the intersection of Peeler Rd. at N. Peachtree Rd. The project will add turn lanes, a coordinated traffic light at Peeler/N. Peachtree Rd., sidewalks and other safety features. In a citizen survey, this was rated as the worst intersection in Dunwoody, so I am delighted it will be our first major intersection improvement to break ground. Work will begin as soon as DeKalb County approves the water main pipe portion of the contract. The work will continue into 2016, with traffic flow maintained throughout the project. Paving and Pipe Replacements on Mt. Vernon Rd. and Chamblee-Dunwoody Rd. The water main pipe replacement project on Mt. Vernon Rd. from Vernon Oaks Dr. to Ashford-Dunwoody Rd. continues on schedule. Crews replaced the pipe in the two-lane area and are now grading and laying the sidewalk. The focus now is on finishing the two-lane area traffic disruption. Then the pipe replacement will continue in the four-lane area of Mt. Vernon Rd. where even if one lane is closed, traffic can still flow in both directions. The project will conclude with new pavement. The "rumble strip" in front of the BP station will finally go away. A similar water main pipe replacement, sidewalk, and paving project is currently in the bid process for Chamblee-Dunwoody Rd. between Roberts Dr. and Cambridge Dr. Once the bid is let, the project will continue into early 2016 and also conclude with new pavement. At our most recent meeting, City Council heard that the current fiscal year is projected to conclude with a surplus. Council provided guidance to Public Works that a portion of the surplus should be directed to additional paving in 2015. Olde Village Court, Olde Village Lane, and Olde Village Run are three poorly rated streets from our 2016 paving list that can now be accelerated into this year. The balance of the 2015 projected surplus will be needed for the increased bids of paving and construction that we're now seeing due to many projects underway in metro Atlanta. Early in my term on Council, I suggested we include in City Council legislative priorities the removal of the barrier for new independent school districts. Fast forward and now here we are with proposed legislation H.R. 4 carried by State Rep. Tom Taylor. We need your assistance. An advocacy group called GLASS (Georgians for Local Area School Systems) is helping with lobbying efforts for this initiative. 2016 could be the year, as support is growing. City Council meetings begin at 6:00 p.m. in the Council Chambers at City Hall, 41 Perimeter Center East, Suite 103. All meetings are open to the public. Come see your government in action! 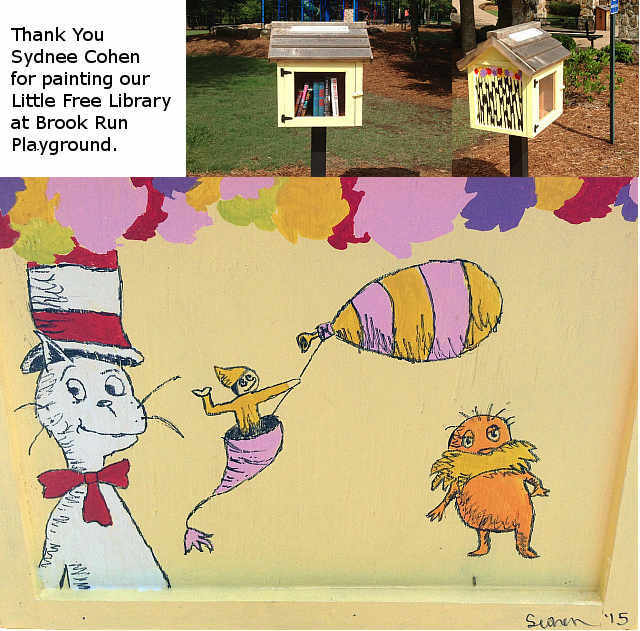 Thank you to Ms. Sydnee Cohen for painting the Little Free Library at the Brook Run Playground. Thank you Sydnee for stepping forward to assist with this project and for providing one of the first works of public art within our park. After stopping by today to see Sydnee's fine work, we need to find a way to keep this box stocked with children's books. I have filled it twice but the Children's books seem to be borrowed more than they seem to be dropped off so maybe a solution could involve the next Friends of the Dunwoody Library book sale? If you have excess children's books that you would like to donate to the cause, I am sure a child would enjoy what ever you have to offer. The City of Dunwoody is asking residents to help name our newest park. What name do you select for Dunwoody's newest park? The city of Dunwoody broke ground and began construction of the city’s third new park in two years! With the creation of this new park comes the important job of finding the perfect name! PARK NAMING CONTEST: The city is holding a contest for Dunwoody residents to vote on a name for the new park. The contest will run from August 5 through September 30 and offers residents a chance to choose one favorite from a list of five potential park names. There’s also the wildcard of an open ended option for residents to submit write-in ideas for a park name. This new 5-acre park is located off North Shallowford Road and Pernoshal Court. The park will feature two sport courts, basketball court, pavilion, large open field area for play, and part of the Dunwoody Trailway. 5. Deadline for entries is September 30, 2015 by 5pm. The winning name will be announced by Dunwoody Mayor and City Council on Monday, December 14, 2015 at the 6 p.m. City Council Meeting. The new park is located off of Pernoshal Court and North Shallowford Road. The name, Pernoshal Park, references the park’s location and connects it to the Georgetown area. Hightower (Etowah) Trail, one of the best-marked Indian Trails in Georgia, was a much-used crossover between two of the noted Trading Paths radiating from Augusta. Recognized as a former boundary between Cherokee and Creek lands, a part of it became, by Act of General Assembly 1822, the boundary line between Gwinnett and DeKalb Counties. Early families settled along the trail and it remained a main road until the 1840’s. Segments of it have been abandoned but many sections remain in use as part of present day roads. The name is believed to come from the Cherokee, Ita-Wa. The native people of Georgia and the Dunwoody area were the Muskogee (Creek) Indian tribes. The Muskogee Indians raised their families, hunted, and farmed Dunwoody land for generations, as far back as 400 A.D.
Old Buck was the one car train that ran from Chamblee to the Chattahoochee River, across from Roswell for 44 years. The train brought goods and carried people, an important part of Dunwoody’s development, until the line was discontinued in 1921. The magnolia flower is seen as the essential southern bloom. The delicate white flowers are only part of the large dignified trees that provide shade and beauty to any park. Vote here under the Name Your New Park link at the bottom of this page. 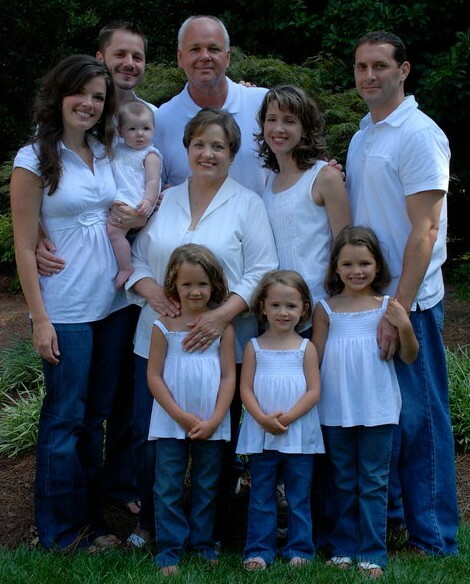 This afternoon Dunwoody City Councilman & Mayor Pro Tem, Denny Shortal vacated his council seat to run for Mayor and though some aspects of this email could be seen as "political", this announcement is important; as the City Council will now be operating with six vs seven members. 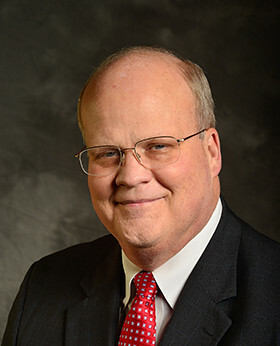 Councilman Shortal is to be commended for his many years of service to the community and for his unselfish decision to vacate his seat early so that his replacement election would match up with the November general election cycle. As far as the parks bond money comments, I believe both Denny & Mayor Davis are correct in their statements. The bonds originally let by the County clearly state that they were to be spent at Brook Run Park and I believe most on Council (including myself) will honor that intention & put a majority if not all of the funds received by the County towards Brook Run Park improvements. That being said, Mayor Davis is also correct that technically under the settlement the money given by the County already went to pay off the new 5 acre park off Shallowford therefore there are no strings attached to the funds that the City put aside for those parks and it will be up to the city council as to how those funds will be allotted. 1. My Status … As you read in the Crier last week I will officially vacate my office as City Council Member of District One, Post 1 and as Mayor Pro Tem this afternoon at 5:00 PM. As most of you know I have announced my candidacy for the Mayor of Dunwoody. This election will be held on November 3, 2015. Georgia State Constitution requires that I vacate my office when I qualify for the Mayor’s position. By your vote on November 3rd you will decide if I will be back as your Mayor on January 1, 2016. I am actually vacating my office 12 days prior to qualifying in order for the city to meet the timelines required to have the election for my current office on the normal election day of November 3. This will accomplish a two fold purpose, 1. have my current office filled at the earliest possible date and 2. save the city the cost (approx. $25,000) of a separate special election at the next available date in March, 2016. 2. My Email Address … As of 5:00 PM this afternoon my Dunwoody city email address will no longer be operative. You will still be able to email me at … dshortsmar@comcast.net. 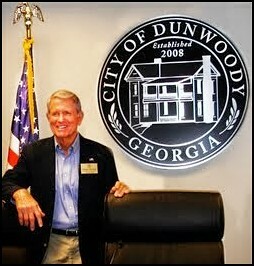 I will continue to send out periodic email updates as a private citizen and as a candidate for Mayor of Dunwoody. 3. Tax Refund Checks … For those of you who are due a property tax refund from the city for the years 2012 - 2014, to quote the famous line “your check is in the mail.” Some of the checks are extremely small, but regardless of the size we ask that you cash your checks as soon as received. This will enable us to keep the city’s financial books correct. For those of you that have escrow accounts with a loan agency, your check will be mailed directly to your loan agency to be deposited in your escrow account. In this case, no action will be required by you. 4. Park Bond Money … Recently we received $4 million from DeKalb County (DC) as a negotiated settlement for the Brook Run Park suit that we filed against DC over three years ago. How that settlement was finalized is that DC would use $3.5 million of these funds to directly pay for park/s currently under construction in Dunwoody. An example of this is the new five acre park at the corner of Shallowford Rd and Pernoshal Ct. We currently have budgeted and funded $3.5 million for the above park construction. When I inquired at our city council meeting on August 10 if the $3.5 Million was in an account for the use in BR Park, Mayor Davis said that these funds didn’t have to be used in BR Park or in any park and that the city council would decide where to use these funds. My only problem with that is that you the citizens have been told through the entire suit process that these funds had to and would be used to enhance BR Park. You decide. The other $500K of the $4 million settlement in part or whole would be used to update the Dunwoody Parks Master Plan (DPMP). My feeling is that we have plenty of smart citizens that with minimal guidance could update the DPMP at little expense and give us a plan that we actually want. Then the remainder of the $500K could be used to enhance Brook Run (BR) Park. 6. Name The Park Contest … Repeat from my last update. Get involved by helping choose the name for our new five acre park located at the old Emory Hospital site at the corner of Shallowford Rd and Pernoshal Ct.. You can participate in the contest by registering at the “Name Your Park" online contest portal at www.connectdunwoody.com. The contest is currently open and closes at 5:00 PM on September 30. 7. Safety … I notice a lot of homes do not have their address posted on the mailbox, curb or house. To help safety vehicles find your house, especially on some dark and stormy nights, I would encourage everyone to have your address highly visible on your mailbox and/or curb. Your house is the last choice. 8. That is all for today. Please pass this on to your friends, neighbors and members of your HOA. If you would like me to speak to the members of your HOA let me know. If you want to be added to my email update list just notify me. Lets be kind to each other. Have a great day! You are invited to join GLASS (Georgians for Local Area School Systems), for a fundraising event. Georgia House of Representatives Host Committee: Joe Wilkinson, Tom Taylor, Mike Dudgeon, Valerie Clark and Buzz Brockway. Meet legislators and hear about future legislation allowing the creation of independent school systems in Georgia. 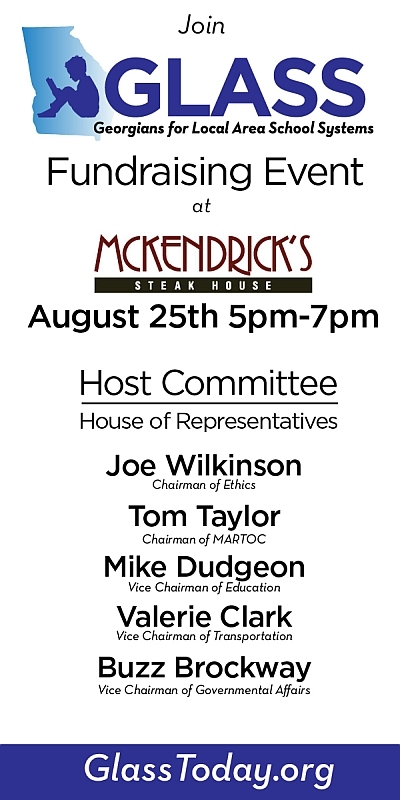 Join us August 25th, 5 pm-7 pm, McKendrick’s Steak House, 4505 Ashford Dunwoody Road, Dunwoody, 30346. Suggested donation $100 per couple. Complimentary light hors d’oeuvres, beer, wine and soda. Dunwoody Restaurant Stories in the news.